Every hour of every day we dedicate ourselves to optimizing the creative experience across industries. We live, eat, drink, and sleep visualization – that deal with the Devil was made the day Silverdraft was founded. When Amy Gile first saw the challenges experienced by VFX artists, directors, and producers working with subpar performing hardware, it ignited the passion, commitment and purpose of Silverdraft. We solve the toughest visualization problems across industries and are dedicated to empowering creatives. With Silverdraft, they are able to express their vision, unencumbered by hardware limitations. Today the visualization challenges and techniques historically found in Hollywood have expanded to include designers and engineers in other industries such as automotive, furniture and AEC, to name but a few. Our commitment to creatives is to know your software, learn your workflows, and identify your perfect solution. Whether it’s our approach to cooling your Demon, architecting your Devil, or just being there for you when you have challenges, our expertise is visualization and we know how to help you be the most productive that you can be. We appreciate your business and time invested with Silverdraft and so we deliver our product fully configured and ready to go so that you don’t have extra downtime doing that work yourself. How did our architecture and technical approach come to be? In 2003, Dr. Srinidhi Varadarajan designed and built the third fastest supercomputer in the world – System X. Coming in at a $5mm price tag, it was only slightly slower than number two, but $150mm less expensive. The secret to his approach was using off-the-shelf components with proprietary architecture. In 2011, Dr. Varadarajan co-founded Silverdraft with Amy Gile and took his price/performance mindset to the challenges of Hollywood. Using supercomputing architecture to address the significant computational and processing needs of high end rendering, VFX, and visualization in the digital age. Rather than focus on core counts or GHz, Silverdraft looks to the actual end user experience and performance requirements. Our design process always begins with the software and customer workflow. We identify the bottlenecks to inform our choice of components – always holding price/performance at top-of-mind. 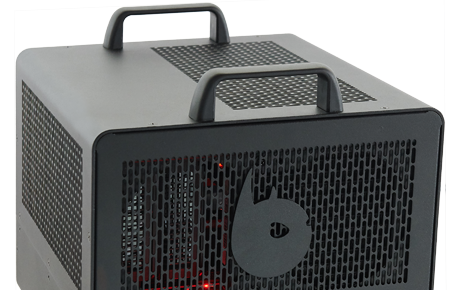 Finally, we assemble and optimize the build using proprietary methods and cooling technology. The result is another member of the Devil and Demon lineup.